Carmel rubbed shoulders with Dr David Starkey and David Ferriby in London AND Manchester last week, at two of Hodder Education’s Student Revision Conferences. Carmel was back in action at the Annual Bett Conference 2019 this weekend, collaborating with Studytracks (Music Memory and Mobiles) and ClickView. Carmel pulls her presenting hat on to introduce BBC Teach’s ClueTubers, a suite of films that will help students get to grips with the skills required to investigate historic sites. Get ready for the autumn term by getting up close and personal with key locations for upcoming History GCSE examinations. The first OTI Osiris cohort graduated as the first "Excellence in teaching" course was held at the Hilton in Glasgow. Revision season is here! Study Tracks featured on Radio 5 Live! Study Tracks join Radio 5 Live Drive Time’s Tony Livesey and Sarah Brett to discuss revision stress as exam season approaches. New Bitesize GCSE History App is NOW AVAILABLE!! The BBC Bitesize GCSE History App that Carmel contributed Elizabethan England content for is available now! Carmel has been awarded a prestigious Fellowship of the Historical Association at the Annual Awards Ceremony on 15th June 2017. Teaching Elizabethan England? Bespoke packages of help are available including an exploration of Hardwick Hall. Carmel teams up with Nathan Ashman to showcase VR in the classroom on the Bett Futures stage at the Bett Conference 2017. 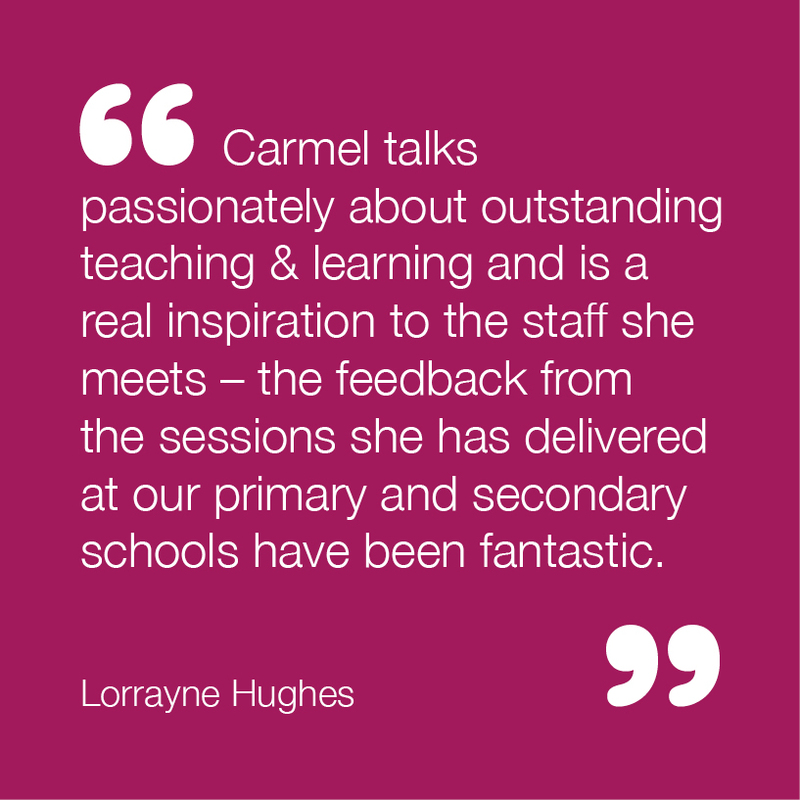 Carmel works nationally in schools with classroom teachers and those who are leading on teaching and learning to achieve short term gains and long term results. A sought after trainer and consultant she tailors INSET to ensure that schools, groups of schools, departments and individuals are enthused and moved forward with their thinking. She is the director of Carmel Bones Education and works closely with Osiris as a team leader and trainer for the (OTI) Osiris Teaching intervention, working with primary, secondary and post 16 teachers. Carmel is an A-level and GCSE examiner. Teachers are talented, busy people with the job of making a vital positive difference to young people’s lives. 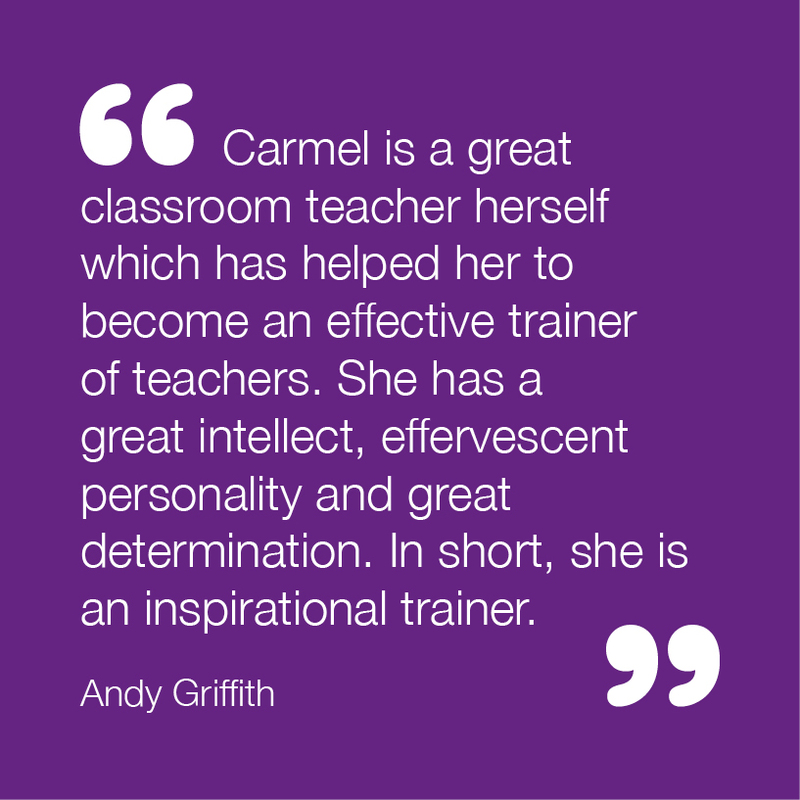 Carmel’s aim is to make Inset practical, memorable and effective. Continuous improvement has been the hallmark of her 20 year teaching experience as AST and HOD. She is ambitious for all the young people and colleagues that she works with. 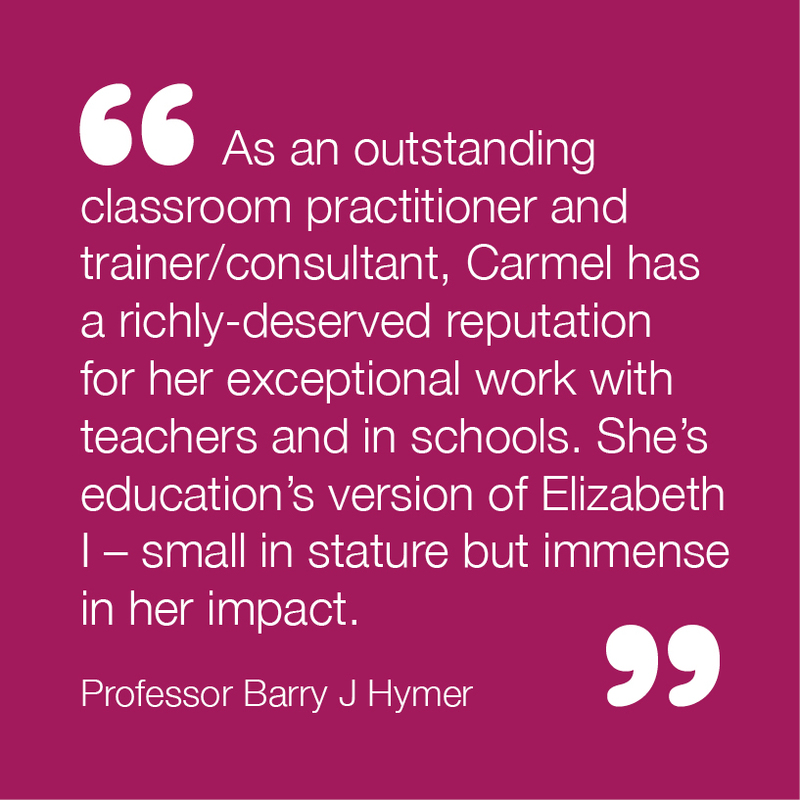 Carmel is also a member of the Historical Association’s national secondary committee and a consulting editor for Hodder Education's new GCSE Dynamic Learning series. Recently she wrote new BBC Bitesize GCSE material and contributes to Oxford University Press newsletters. She leads workshops at the annual Historical Association and Schools History Project Conferences. In June 2017 Carmel was award a Fellowship from the Historical Association.